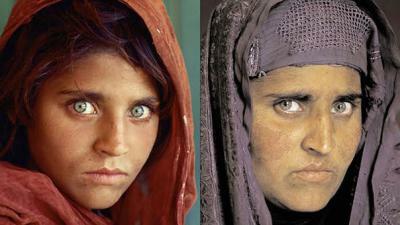 PESHAWAR: Gaining fame for featuring on the cover of National Geographic magazine in 1985, ‘Mona Lisa of Afghan war’ Sharbat Bibi has been living with two of her sons in the Khyber Pakhtunkhwa capital for the last several years. Bibi was identified when she applied for the National Identity Cards (NICs) for her and her sons last year. The famous photo of the 12-year-old Sharbat has often been compared with Leonardo Da Vinci's Mona Lisa. The National Geographic rediscovered her in 2002 after she remained anonymous for years after the first iconic photo of 1985. Nat Geo photographer McCurry knew immediately that he had found her again when he met with Sharbat after getting her family’s permission in 2002. “Her eyes are as haunting now as they were then,” he had said.